As you can see, Onyx isn't being released today as planned. Life's been a little crazy in my world. Good news is things have been improving for us and I am so grateful for all the prayers and well wishes for my son. And as long as we stay on this drama-free course, the ebook of Onyx should be out in December and physical books in January. 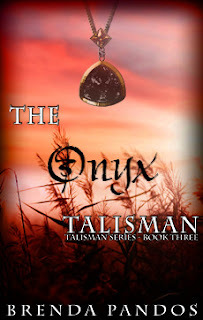 I apologize to all of you who have been waiting so patiently and can't wait to share with you the last installment of the Talisman series. So, without further ado, here's the first *unedited* chapter of The Onyx Talisman!! Three ore cards mocked me within my undisclosed hand, along with a few others. If I traded my ore—which I really didn’t need—he might win again. His smug aura told me he pretty much had this game in the bag, it was just a matter of time. Within moments of the trade, Phil switched out his city for a settlement, pleasure beaming from him like a strobe light. “Nice,” Tyler said with a twisted grin. “I need a brick and Phil’s sitting on a brick factory over there.” She pointed at the board and shrugged. Tyler’s turn was next. As I watched him palm the dice, my competitive side itched for lady luck to grace me this turn. Normally the rolls I needed came up all the time, but not in this particular game of Settler of Catan. Scarlett sat off to the side and read her worn Tales by Edgar Allen Poe. The fact she enjoyed the stories as much as she did gave me the creeps. Her mind reading abilities had ousted her from playing any games with us—not that she’d play anyway. Tyler blew into his partially closed fist. “Come on karma! Papa needs a new set of shoes.” He shot us a coy smile then winked at Katie. I withheld my comment as Katie giggled. If she got the karma she deserved, she’d lose every game. Quick as a flash, Katie grabbed his hand and kissed his fingers before he could fling the white cubes. The interruption discombobulated his throw, causing them to skitter from his hands, across the table, and onto the floor. I peeked over Tyler’s knee and watched one of the die move of its own accord from a four to a five. “You so cheat,” I accused Phil, who at the moment looked bewildered. “That was so a four.” I pursed my lips and raised a brow as guilt billowed out of Katie like a hole in a balloon. “Yeah. No fighting.” Tyler flipped it back to a four and finished his turn. Katie’s turn was next. I crossed my fingers for something I could use. “Eight,” she called out. While she traded out her cards and pieces on the board, I playfully mad-dogged Phil. Our competitive sides quietly bantered with one another through our eyes. My turn was next and I only had one chance to finish him off. Without looking, I kept an eye on Phil and felt for the dice when Katie’s shock and sudden elation sliced right through my psyche. Her squeal, followed by her inhumanly fast flit around the table, upset the board onto the floor. Annoyed, I pushed away from the table and moved over to the couch opposite Scarlett, away from Katie’s blatant display. Though she rarely won, I wouldn’t indulge her poor sportsmanship with any type of congratulations. Phil came over and sat next to me—a little too close, actually. His wonderful natural scent filled my lungs and tempted me to bury my nose in his neck. “Awww, don’t pout,” he whispered in his honey golden voice. A huge part of me wanted to lean over and kiss him right then and there, but I knew his powers of persuasion were running at a high level. I fought the temptation and pulled out my iPhone instead, searching for a text from my missing boyfriend Nicholas—an obsession I couldn’t kick. His words sent little pin pricks of pain radiating across my chest. Every day I’d conspired a way to get Phil to take me to L.A to see Nicholas and every time he’d tell me no. Since the big showdown four months ago, the only word I’d received to even suggest he was on the mend was a letter stating he missed me along with some song lyrics he wrote and a reassurance he’d return soon. That was a month ago. The lyrics lay neatly folded in my pocket next to my phone. I’d continually read and reread them, looking for clues to what he was thinking. But all I could decipher was that separated ships never docked at the same pier at the same time. Was that how he saw our relationship? Something that could never really be? “I can’t keep doing this day after day. I have to find out something,” I finally said with clenched teeth. I sunk into his chest. Whether I liked it or not, Phil did make me feel better. My spirit mended in his presence and I was beginning to need him—like a drug. I shut down my empathy and closed my eyes so I didn’t have to watch Katie and Tyler snuggled up together on the opposite couch as they started a movie. She of all people didn’t deserve the happiness wafting around us and lately my jealousy was getting the better of me. I didn’t want to be a love buzz-kill, but their blatant displays often rubbed raw the longing in my heart. But, for some reason I always returned to hang with the Fab Five. Sam, my absent BFF, had all her free time sucked up with Todd, her boyfriend. So, I had no choice but to melt into the coven’s regular routine where my melancholy mood was understood, for the most part. Phil and Katie were our sober vampires, Tyler and I were the inducted humans, and Scarlett was the token den mother—a very motley group. After school, Tyler and I would cruise over and hang out at Nicholas’ abandoned house where Phil and Katie hid during the daylight hours. “Do you have homework?” Phil asked while petting my hair. After a few minutes and with much reluctance, I slid down onto the floor and pulled out my backpack. My report wasn’t going to write itself. Phil continued to try to distract me by playing with my hair, but eventually succumbed to the movie. I started to read about Betsy Ross, the subject of my report, but my mind drifted. The group didn’t know it, but I’d devised a new plan. Sam and I were going to Disneyland for a few days as soon as school was out for summer. She’d scored tickets from her aunt and during the trip somehow someway, I’d get to Preston’s house and see Nicholas in person. I had to. I refocused my attention back to Betsy Ross when I felt it. A storm of rage sped towards Nicholas’ house and whomever the feelings belonged to, they weren’t about to let a door stand in their way from getting inside. I stood up, eyes glued to the sunlight blocking barrier as I held my breath, hoping that someone was Nicholas. “Parker, what’s wrong?” Phil asked before Scarlett’s warning screamed in our minds. The sudden movement of vampires escaping the scene launched my notes into the air like confetti, leaving Tyler and I alone to deal with whoever was about the come through the door. I can't wait. December is taking FOREVER!!! love the teaser, can't wait for the release, but glad your son is doing better. Sending lots of healing thoughts to you both.